1. Preheat the oven to 170oC, gas mark 3. 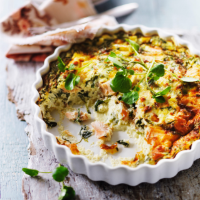 In a large bowl, beat the eggs, then whisk in the fromage frais, crème fraîche and cornflour. 2. Place the watercress in a large bowl and pour over boiling water. Stand for 1-2 minutes, then drain well and chop. Gently stir the watercress, chives and salmon into the egg mixture. 3. Sit a 22cm ovenproof dish or flan tin on a baking sheet. Pour the egg mixture into the tin, then scatter over the cheese. Cook for 35-40 minutes until set and golden. Leave to rest for 4-5 minutes before serving with salad. This recipe was first published in Mon May 11 10:56:29 BST 2015.